“A room of one’s own,” Virginia Woolf once famously suggested, is what a woman needs to get any writing done. Alas, even if you have a writing room in your house, the rest of your house is still there to interrupt you when you sit down to focus your creativity… Wait! Did you remember to start the dishwasher this morning? Better get up and check. Oh, is that the doorbell? Look, a neighbor has arrived to chat. And did you ever return those phone calls from yesterday? Better do it now before you forget. Finally, a moment arrives when you can get back to your thoughts and really dig in… my, but how the time has flown and now you’ll need to get dinner started. Sound familiar? 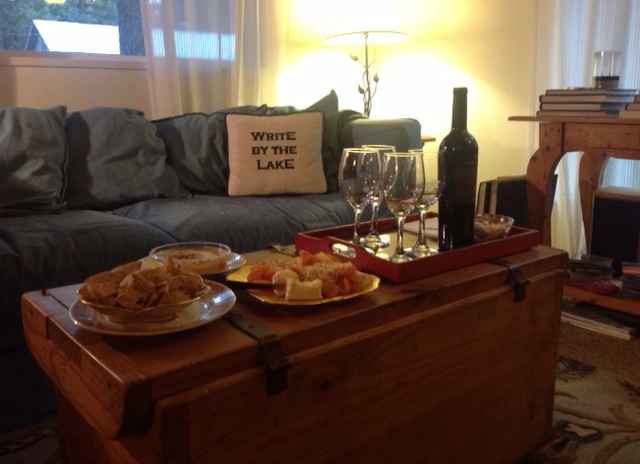 Instead, why not spend the weekend in Lake Tahoe in a quiet room at “Write By the Lake” with other women writers, lots of wine, and wonderful food? I’ll be there too – Jennifer Sander, of The Complete Idiot’s Guide to Getting Published and some fifty other titles. A former Random House editor and long time book packager and publishing consultant, I’m happy to build a cozy fire and chat all night long about the trials and tribulations of the publishing world. Saturday: Breakfast before 9, private writing from 9 until 12. Lunch break and a short walk to the lake, afternoon writing time from 1:30-5. Dinner at 7:30. Sunday: Breakfast before 9, writing from 9 until 12. Lunch break, another bit of leg stretching, another round of goal setting, and then writing all afternoon until it is time to head back down the hill. $345 fee includes all: a private room and all meals and drinks. I hold this small event a few times a year at our South Lake Tahoe house, with a maximum of three writers each time. This is your chance to get started on a new project, finish up an old one, or just sit quietly and let your thoughts and creativity surprise you. Let me know if you are interested, I’d love to see you there! Jennifer Basye Sander, co-author, The Complete Idiot’s Guide to Getting Published, founder, Write By The Lake, A Writers’ and Publishers’ Retreat. Sounds perfect for you? The spots fill up quickly, reserve now at basyesander@yahoo.com or call 916-847-9090. Hello I was at Word Wave this weekend and picked up your flyer. Is there available space for your December writing group? I am taking your Hemingway theory to heart and am going to write and network. I am Marie Johnson, I live down here in Carson Valley on my husband’s family beef ranch. After 5 generations, ours is the one to see the ranch’s transition from agriculture to the unknown. I don’t want all the history lost so I write. Marie! I have another writing retreat weekend coming up this August if you are still working on your project and that fits your schedule. Hope you have been writing down the history since WordWave two years ago.